As online casinos go, High Roller is definitely one for the modern day player who doesn’t take things too seriously – and perhaps also those with a naughty streak. Energy, excitement, and immersion are the order of the day, as well as around 800 different games to chew through. We thought that might get your attention. This little gem of a casino burst onto the scene in November 2017, offering a huge game library for a newbie with a seriously heavy focus on slots old and new. These are delivered hand in hand with an equally impressive and diverse Live Casino. Poker players or those who like a more authentic experience might like to give it a miss, but for everyone else, this is a casino you will enjoy. Created to offer players “more than senseless spins from a faceless shop”, High Roller is run by Betit Operations Ltd registered in Malta, and they are focussing on mischief and rewards. This is one of those rare casino’s that genuinely has something new to offer. Read on for a clearer picture. 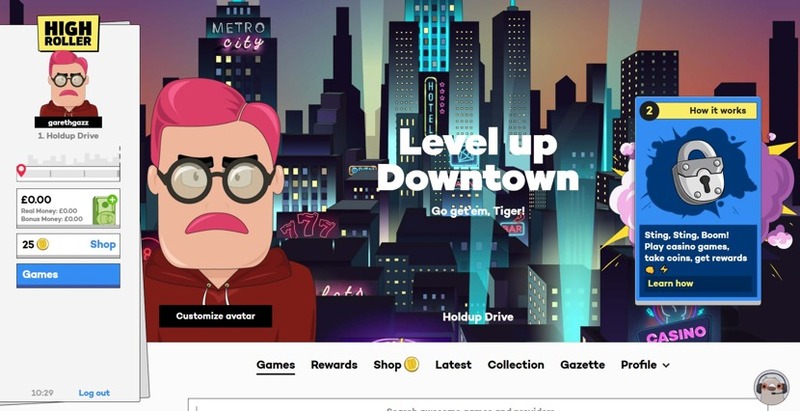 High Roller really thought outside the box with the look and feel of the site, not to mention the concept behind it; their site is simple to use yet wholly entertaining. Once logged in you enter the sprawling dark metropolis of Metrocity, which you can explore district by district in return for coins and rewards; but don’t leave them unattended for too long or you might get stung – more on that later. The whole thing feels like a computer game/casino hybrid, with a high def comic design revealing your own avatar, which you can personalise, and the city beyond. This is all incorporated into the interface, so your characters’ info sheet (or police mugshot perhaps) serves as a quick menu of sorts. They even have their own newspaper – the Holdup Drive Gazette. 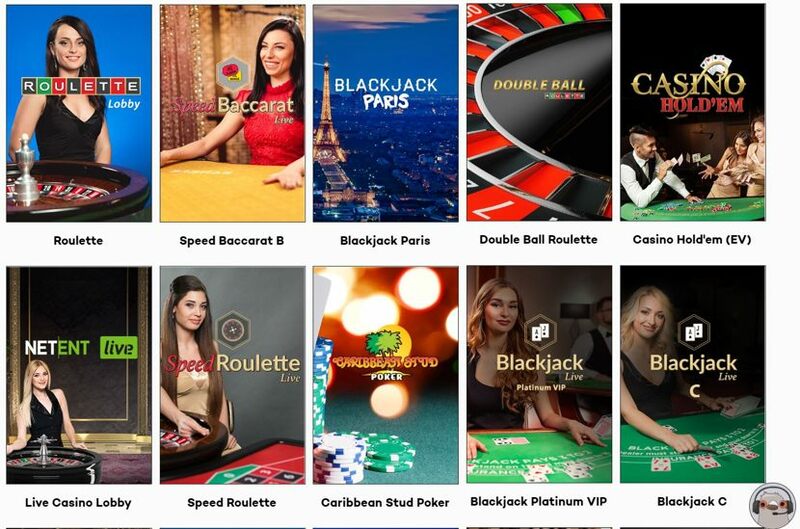 It wouldn’t be possible to provide close to 800 games without employing the help of numerous software providers, and High Roller have done just that. This haven for reel spinners everywhere is powered by the likes of Microgaming, NetEnt, Play N’Go, WMS, Red Tiger, Lightening Box and Barcrest to name just a few. Luckily there is a search bar to easily access your favourite slots, but there are no filtering options, so browsing for something new could turn into a bit of a marathon. The whole thing runs on the Everymatrix platform with all games being instant play – no downloads here – and it works perfectly; it moves well, games load very quickly, and there are high quality visuals. There are also well-placed information box’s relating to what you are doing, so it feels like wherever you look there is something to take your interest. Slots – With a mountain of around 650 video slots and growing, you will have a job getting through the lot. Gonzo’s Quest, Da Vinci Diamonds and Pixies of the Forest are always popular, but it was The Mask that caught our eye. P-A-R-T-Why? Because I gotta! Live Casino – Evolution Gaming provides the goods here, totaling more than 30 games seemingly covering every take on Blackjack and Roulette under the sun. Poker players may want to go elsewhere, though. Jackpot – You have 16 opportunities to take home the bacon with High Roller. Mega Moolah/Fortune/Isis are all there, but we fancy Keystone Kops ourselves. Table Games – Deal or No Deal Blackjack is the latest addition to this collection of 35 games. Others include Poker Pursuit, Keno3, and of course plenty of Roulette and Blackjack variations. Classic Slots – If you are pining for the fruit machines of old, then head to the Classic Slots area and work your way through 40 nostalgia inducing titles. Stings – This is essentially a ploy to keep you coming back for fear of losing your coins. At regular intervals you (and others) will be allowed to steal coins from players who have been inactive for 5 days or more. To be clear, this isn’t your real money, but the coins that the site variously awards you. It’s clever, and fits in with the Metrocity vibe. There is no High Roller app, but if you want to use your account on a phone or tablet then you can do so via the mobile optimised website. It is similar to the desktop site but feels more like an app, in the screen is dominated by the games; everything else is stored behind the menu button (which brings up your avatar) including Live Chat. 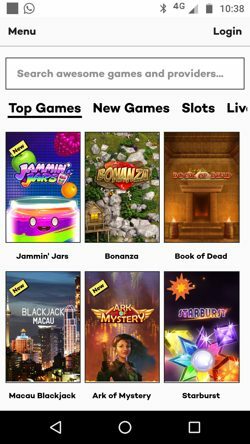 In terms of features you don’t lose anything at all, and when it comes to Slots you will only lose about 20% of the game catalogue by playing via mobile, but in most other categories that will be more like 50%. However, that still leaves plenty to work with, and the good news is that they work beautifully. 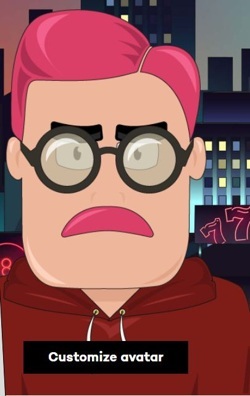 It doesn’t feel quite as exciting or immersive playing on the small screen, a lot of the cool graphic content disappears which is what helps to create the Metrocity world, but we are nit picking really. The mobile site works like a charm and gives you everything you need to make that commute to work a little bit more bearable. High Roller pulls in a respectable score for their banking options, with all of the usual suspects available including a few E-wallets. They claim to process withdrawals within 24 hours too, which isn’t bad, and there are no fee’s, which is great. Obviously, your payment provider will need to do their thing before you get hold of the cash, but High Roller are certainly pulling their weight when it comes to getting your winnings over to you at speed. High Roller was declared open for business in late 2017 by its parent company Betit Operations Ltd, who previously ran Thrills Casino and Super Lenny. They opened with a bang offering a fully developed product with depth and range, letting the online gaming world know that they were here to shake things up a bit. It’s a bold move to try and create an interactive and almost story based gaming experience, and it will certainly make High Roller stand out, but could it push more traditional players away? Or could it be that High Roller will be the pioneers of a new age in the way people gamble online? Since they are so new the verdict is still out on how well they will fare in this saturated market, but Betit Operations have form in the area so High Roller stand every chance of creating a firm foothold in the industry. We were impressed when we used the Live Chat feature as it didn’t impede on anything else we were doing, and thanks to the notification sound we didn’t have to watch it like a stalker to check if we had a reply. It’s also a 24/7 service which will be a relief to late night players. The e-mail address delivers quick responses too, so even though there is no phone line customers can still get the help they need quickly and at any time from one of High Rollers ‘Backup Crew’ – bruv. 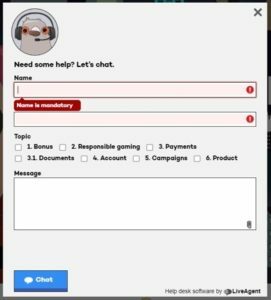 The Live Chat button is ever present (it looks like a pigeon with headphones on, though, just so you know) and the FAQ is kept to the basics so it isn’t overwhelming. In general, although not as well rounded as at other casinos, the support at High Roller is very good both in terms of availability and personality. You will be hard pressed to find any grumblings online either which is a very good sign indeed, even though it is early days, as we all know how much players like to share their bad experiences. Live Chat – After a brief wait we were connected and had our questions answered in a friendly straightforward manner. You also get to decide whether or not to ‘reward’ the advisor at the end of the chat, which you will enjoy if you have a God complex. Email – The address for UK customers is crew@highroller.com and you should get a response within a few hours. Tick! Phone – There is no dedicated phone line for customer support, sadly.